Coffee and Cream Roorkee - Merry Christmas, Janet! The Coffee and Cream Roorkee. I am the youngest of seven children, and to make things less painful for us when we were kids, we used to draw names from a hat to determine for which of our siblings we would get a Christmas gift. We continue this tradition today, although we rotate who gets whom for Christmas. This year, I had my sister Janet, the third girl in our family. 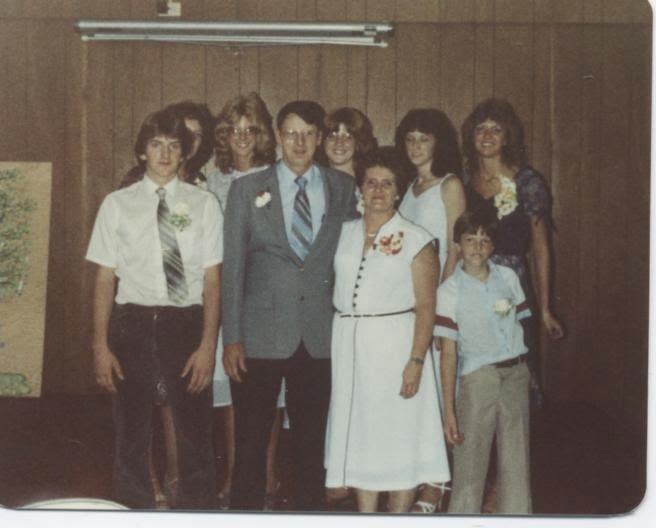 Here is an old photo of the whole family. I'm the youngest, the boy with his fly open. Janet is the third oldest, the one whose head is hidden behind my brother Chuck. The chair is made from wenge (Millettia laurentii) and a hair-on cow hide. I was originally going to use oak or ash. On my way to the lumber yard to buy some lumber for this project, The Frau asked if I had anything in my own lumber pile that would work. It turns out I had some wenge from a project that never got started. Lucky for Janet, it was perfect for this project. I am extremely happy with how this chair turned out. 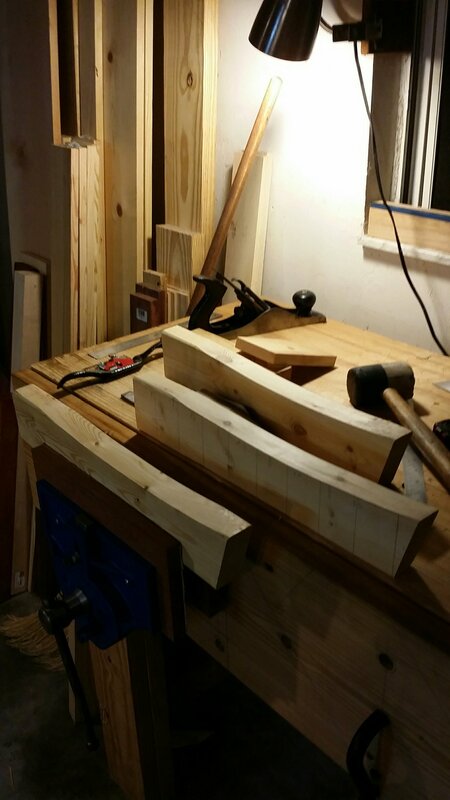 It was a bit of a challenge: I did most of the work at the Dictum woodshop, but didn't quite get everything done in the few days I had allotted. It was a comedy of errors that prevented this chair from getting done in plenty of time to be mailed by Christmas. It was finished just yesterday. Mental note, start Linda's gift earlier next year. Most all of the woodwork was done with machines this time, in order to make this a fast project. The woodwork actually did go fast. Rough work such as cutting rough stock to dimension, jointing and planing are undoubtedly quicker with good machines. I turned the legs using both my Easy Rougher, and a roughing gouge that Andy at Dictum helped me with. I even used a router table to make the octagonal stretchers. It worked well. The trick is finishing everything off with a swipe from a plane to remove machine marks. One challenge I had to overcome was the relative delicacy of the cowhide. It was too soft, pliable and stretchy to be used by itself. For the arms, I toyed with the idea of using only 10 ounce vegetable tanned leather with the color seen on the belting elsewhere on this chair. It didn't look quite right. The cowhide was way too thin for use in the arms of this chair, so I glued the cowhide to the veg-tan for a stout arm strap that looked the way I wanted it to. The carriage bolt shown was stripped, sanded and blued with gun-blue. I finished this chair with pure tongue oil thinned with some organic turpentine. Once this was well cured, I applied a thin layer of paste wax. This is a nice, no-nonsense finish that leaves you admiring the wood, as opposed to the finish. One other thing that I had to think about when cutting out the leather, was the fact that the direction the hair fell on the hide needed to be in a certain orientation. I wanted it to go front to back on all parts. This I did, but it required wasting a bit more material than when I use plain leather. Merry Christmas, Janet! Here's your gift. The seat needed some strengthening, too. I chose to leave the back piece alone, but I knew the chair would not last more than a few days if I didn't do something with the seat. I thought a long time about how to attach canvas to the leather. I decided to use wood glue on the front and back. While I was fetching some glue, I realized I had some spray glue, and instantly knew this was the way to go. I attached the red canvas with spray glue - you know, the stuff that is used in the cartoons. I cut it to the exact width and a couple inches longer than the seat piece. I folded over the edges, and ironed the creases crisp. Then, I sprayed a little glue under the fold before spraying both the canvas and the leather seat liberally with glue. Canvas spray glued to the cowhide for strength. I wasn't sure how this would work with copper rivets, but I needn't have worried. Everything turned out perfectly. Copper rivets fix the leather straps with the canvas-backed cowhide. One other bit that required attention was the edges of the arm straps. The leather on the cowhide was a grey color, and the veg-tan is a flesh color. The answer was after trimming and smoothing the edge, to paint with some brown Edge Kote. I think it turned out just right, if I do say so myself! Edge Kote on the laminated arm strap (it is upside down on the floor in this photo). 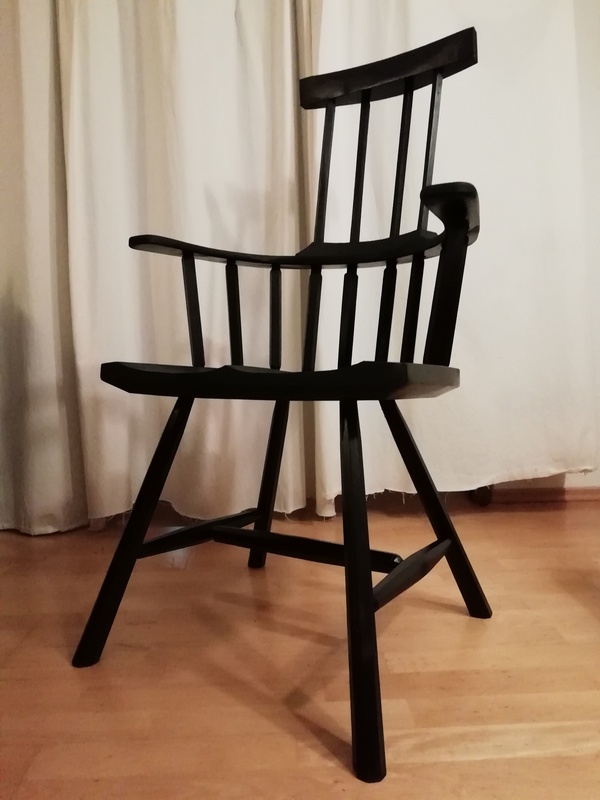 This is the third Roorkee chair that I have built. Having done a few of these now, I think I would like to comment a bit on their construction. The new and the old: My first chair from pear. A chair I built with my dad: diamond willow. Much of the woodworking can easily be done by hand, and there really isn't too much wood that is needed. Care should be given to the stretchers, that the grain is as straight as possible with no runout, if possible. Strong stretchers are a necessity. All three chairs I built had a different style of dowel: The first one I cut the wood along the grain and turned the dowels to a cigar shape as laid out in Chritopher Schwarz's book, Campaign Furniture. The second, diamond willow chair I used store bought oak dowels, but picked out ones that had as straight of grain that was possible. This chair I sawed out the stretcher blanks along the grain as best I could, and made them octagonal with a chamfer bit on a router table. The octagonal shape left a little more meat on the one inch dowel blanks, and was a bit simpler for me as a novice turner. All three methods I can recommend. Also, do not be afraid to drill the holes for the stretchers and ream the tapers by hand. Using a bit and brace is not much slower than a drill press, once setting up the machine is added to the time. Just use a square to check your work once the taper gets close. You can 'steer' the brace one way or the other a bit until it is dialled in just perfect. Most of all, I think that one should not be afraid to go outside of the box when making a Roorkee chair. Unless you are trying to make a faithful reproduction, why not put your own stamp on it? This chair has a lot of room for being flexible with the design. The Frau and I had the opportunity to spend a few days in London this week, and we had a great time. The first thing we did was 'afternoon tea.' The Frau ordered a traditional afternoon tea. It came with Earl Grey, cucumber sandwiches and the whole works. I intended to do this, but there was something on the menu called 'Gentleman's Tea,' and I felt morally obligated to order it. Turns out this version of afternoon tea came with beer and meat. Perfect! Afternoon tea at the Kensington Close Hotel. Having been to London as a tourist before, I didn't need too many more photos of me with Big Ben, so it turns out I took relatively few pictures this time. One of the things I forgot to take pictures of, was a fellow woodworker I got to meet up with, Travis from Snakeye Toolworks for a few pints. That was fun. What I did find on my camera on my way home was a bunch of pics of furniture from one of the museums we went to: the Victoria and Albert Museum. Technically this museum is free, but they do a good job of guilting you into donating a few bucks to see the displays. There was a lot of cool future in this place. I saw a couple pieces of note that I will share here. The first is a sideboard designed by E.W. Godwin around 1870. I can't see myself building either of these two pieces, but of the two I can see including some elements from this piece on a future project. Here's the placard describing the piece. Close up of some details. This piece is even more incredible in person. Designed by Bruce James Talbert. Close up of the detail. It is amazingly clean and crisp, and there is a LOT of it. I wound up at the V&A museum because The Frau wanted to see a photography exhibition there. What I really wanted to see this time was the Museum of London, with all the history of the local area there. Unfortunately, there was very little woodworking of note displayed there. The coolest piece I found was this wooden Highlander. It was used to sell snuff much like wooden tobacco indians were in the U.S.